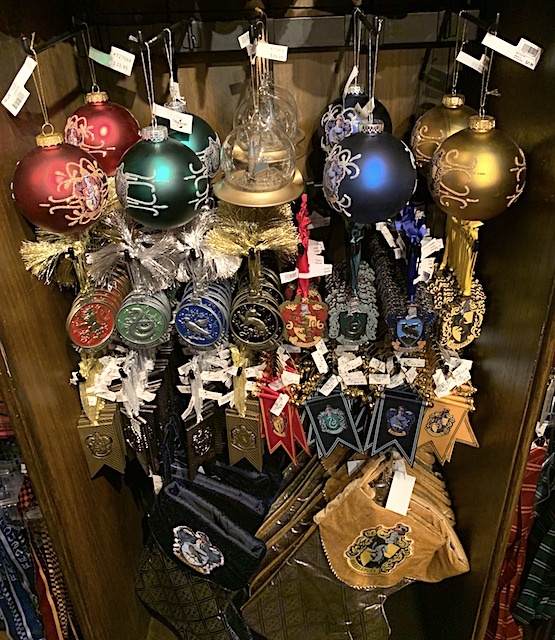 November 18, 2018, 10:46 PM · It's Christmas in the village of Hogsmeade in The Wizarding World of Harry Potter. After sampling the holiday offerings at the Universal Orlando Resort last week, I flew back to Los Angeles today and made my first theme park stop Universal's original park in Hollywood. Christmas in The Wizarding World of Harry Potter started yesterday at Universal Studios Hollywood, running daily through January 6, 2019. 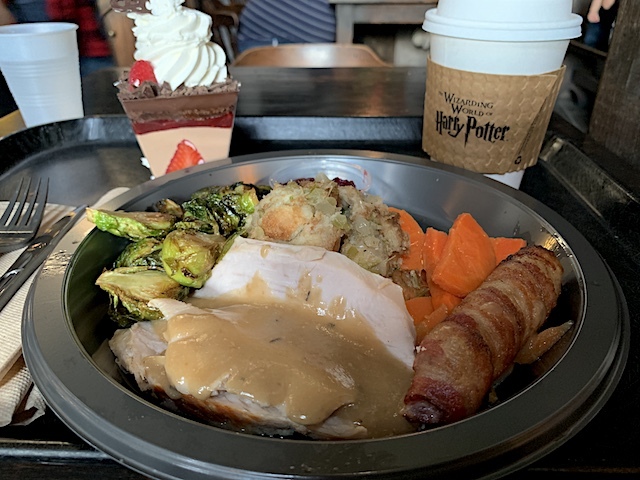 With its two main entertainment elements happening after dark, I started my late-afternoon visit with a trip to The Three Broomsticks for the west coast version of the Wizarding World's Holiday Platter. Offered at $15.99 — the same price as in Orlando — the Hollywood version differs in a few ways. There is a bit less turkey, but the platter balances the protein with the addition of a bacon-wrapped sausage — a very LA touch, given the ubiquity of bacon-wrapped hot dogs in this town. The stuffing is served in a scoop rather than slices and the (superior) gravy is poured over the turkey instead of being served on the side. The Brussels sprouts come here without walnuts and it's all carrots instead of a mix with parsnips. The carrots here also come glazed in ginger, which adds some flavor (and probably some calories, given the sweetness). But the big addition in Hollywood is dessert — a Chocolate Trifle, served with berries and topped with chocolate and whipped cream. On the whole, the addition of the dessert tips the value in favor of the Hollywood version, but both are outstanding choices for a theme park meal — no matter what the time of year. I miss the original "Feast for Four" version of the holiday meal, with its roast turkey and beef Wellington (that was crazy), but I welcome the value and convenience of a single-serving holiday option. Having arrived late in the afternoon, I missed the holiday performance of the Frog Choir, so I passed some time before the evening's festivities with a glance at some of the holiday ornaments for sale throughout the land. In addition to the house-themed ornaments and stockings there are house-colored garland available this year, too. You can find examples on the trees standing at each side of the Frog Choir stage. Soon the sun had set and it was time for The Magic of Christmas at Hogwarts Castle, along with a new feature this year in Hollywood — snowfall in Hogsmeade. The return of the Hogsmeade light shows each season mean wall-to-wall crowds in The Wizarding World, and as I exited I saw that Universal's team members were holding people in a queue outside the land, pulsing the crowd through for each performance of the light show. If you don't want to get caught in the crowd, be sure to arrive in the land before dusk. The holidays continue at Universal Studios Hollywood next month, when Grinchmas returns to the Universal Plaza, running weekends in December and daily from December 14 through December 30. FYI, the snow happens a few minutes after each castle light show, and it focuses on the block between Ollivander's and Gladrags. I suspect that they're using the snow to help clear the crowds from in front of the castle and get them moving back into the village, but hey, play along if you want the best view of the snow. As soon as the show ends, start walking back toward Ollivander's and you should make it just in time. Don't dawdle. Hi. Does anyone know if the Express tickets reserve you a spot at the Hogwarts light show? It's not overly clear on the website. Coming over from the UK over Christmas and don't want to miss it! Cheers. There is no reserved viewing area for the show. First come, first served. But it runs several times a night.